One of the things that I enjoy most about comics, is the way writers use flashbacks to tell stories that impact the current events going on in the series. X-O Manowar #18 is the perfect example of this. 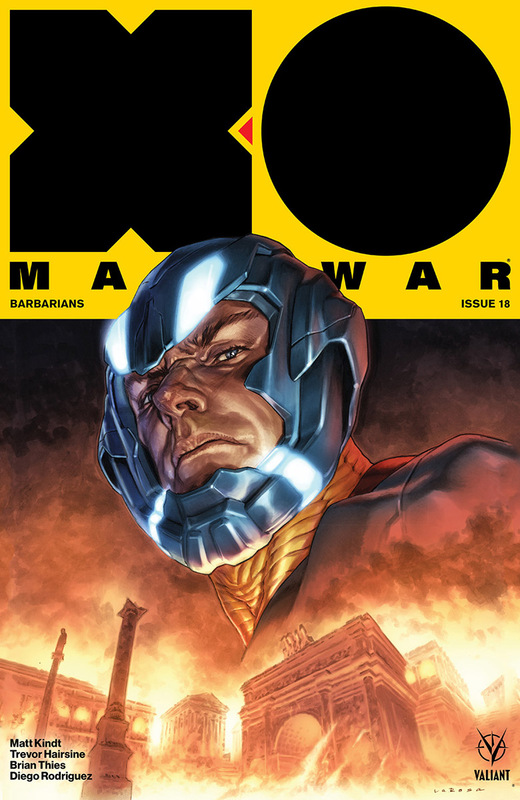 X-O Manowar #18 finishes up the current “Barbarians” story arc that flashes back to Aric’s past. Aric is fighting in the arena with his new ally Sabbas who will help him rescue the young brother of his best friend. As Aric and Sabbas finally track down young Batwin, things are not as they seem. It’s up to Aric and Sabbas to try and bring him home! There are a lot of spoilers in this book so I will not go any further. Once again Matt Kindt proves that he is the best writer for this book. The emotional that he has taken Aric on throughout this story arc has been incredible. My favorite moments from Kindt don’t come in the action scenes but in the small moments. I love the interactions between Aric and Sabbas and it almost feels like a road trip movie. They play off of each other really well and Sabbas provides some well received comic relief. Kindt has made me feel so many emotions on this run but this time he made me feel so much. The art by Trevor Hairsine is awesome. Every panel of this book is gorgeous and Hairsine shows that he has such a great grasp on drawing these characters. While I said above that my favorite moments from Kindt are the small ones, my favorite panels in this book are the ones filled with action. The battle scene at the beginning of this book looks like it could be in a movie. I love the frantic pace and I love the excitement it made me feel. I will say one more thing about the art in this book and that is the last panel with Aric is amazing and should not be missed. I couldn’t find anything wrong with this book. I love it and I can’t wait to see where Kindt and Hairsine take this series.